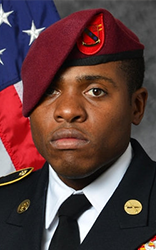 30, of Brooklyn, New York, died Aug. 13, 2017, in Iraq of wounds sustained while engaged in combat operations. He was assigned to 2nd Battalion, 319th Airborne Field Artillery Regiment, 2nd Brigade Combat Team, 82nd Airborne Division, Fort Bragg, North Carolina. The incident is under investigation.